Now, more then ever, budget is an issue in my new life as a single gal so when it came to putting the finishing touches on my new guest bedroom I knew I was going to have to get really creative. Once I completed the old steel bed frame (check out that transformation here) I really really really wanted some ruffles for a bed skirt. But not like really girly ruffles, they still needed to be farmhouse and country ruffles, nothing too feminine because that just wouldn’t be my style. 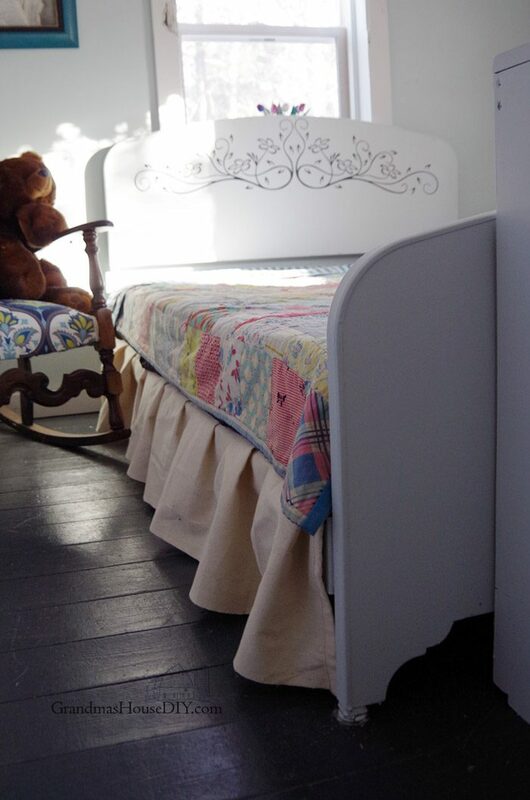 I do not sew, nor am I crafty, but looking online I found a dilemma that even if I did find a bed skirt I liked (which I didn’t) I would still have to modify it as this bed is only going to work with a bed skirt on the sides and not the foot. 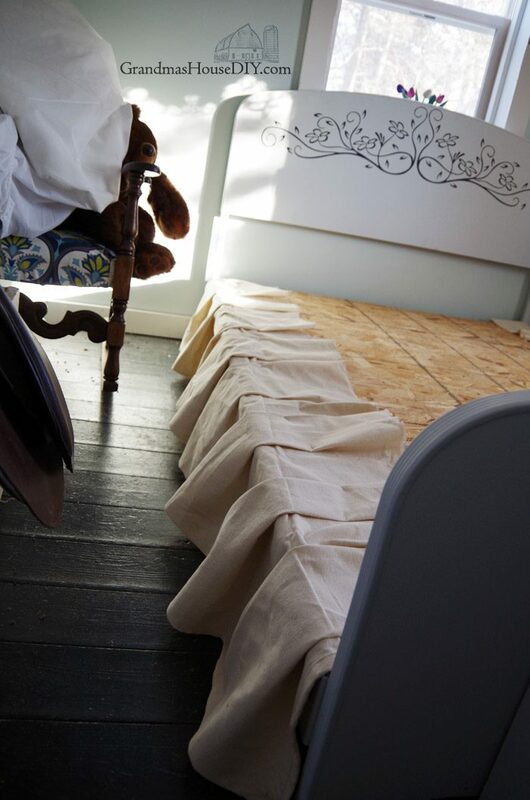 While I was painting the furniture for this room I used canvas drop cloths to protect my floors so they were with me when I was trying to figure this out. A light bulb went off. Why can’t I just use them? All in, I am pleasantly surprised by how much this dressed up this old bed. I have always HATED bed skirts, honestly I never owned a bed where the bed skirt fit correctly at all. Most of the time it was hanging halfway off the bed on one side etc and just looked terrible. 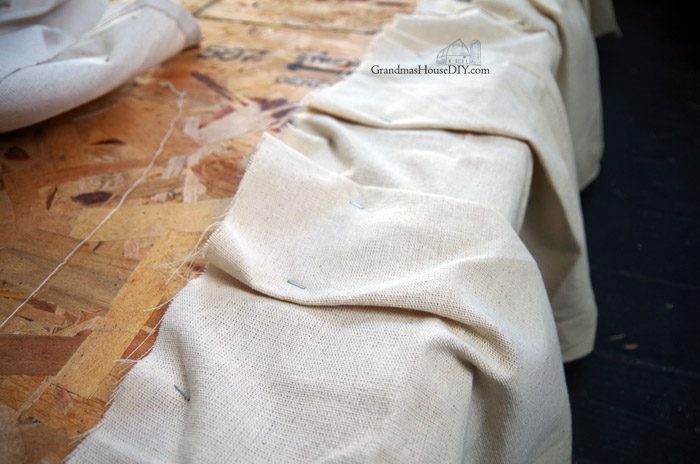 I remember finally using safety pins on my last bed skirt when I still had a box spring. In this case I could use staples because the mattress is temper-pedic and only requires a hard surface to lay on top of. 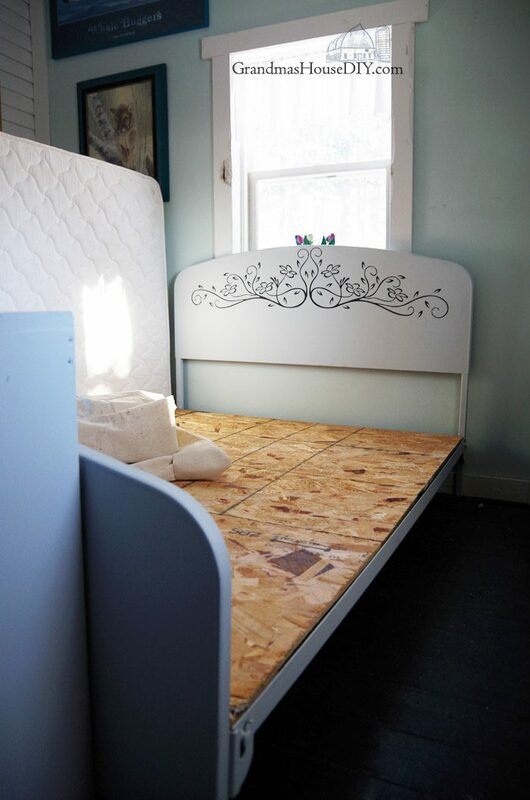 In the case that you wanted to do this project with a regular mattress and box spring I don’t see why you couldn’t just use safety pins instead of staples! 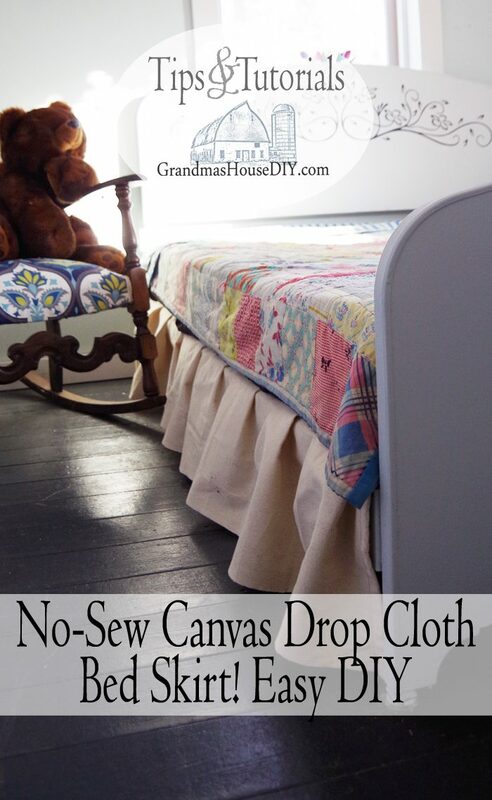 Thanks for checking out my little no-sew canvas drop cloth bed skirt project! Can’t wait to show you the rest of the projects coming up soon and my final reveal of my country girl guest bedroom and library! I beg to differ, you ARE crafty. Look at all you craft with your hands, your creativity and ingenuity! Don’t sell yourself or your skill set short! Thank you hon! Have a wonderful week! What a clever way to make a dust ruffle. And it is such a bonus that it won’t slide or shift out of place. I enjoy reading your blog and I admire your can-do attitude after dealing with a difficult marriage and then going through a divorce. I wish you the best in all that you do. Thank you so much Kathy! Have a great week! Quite excellent! You have so much to be proud of! 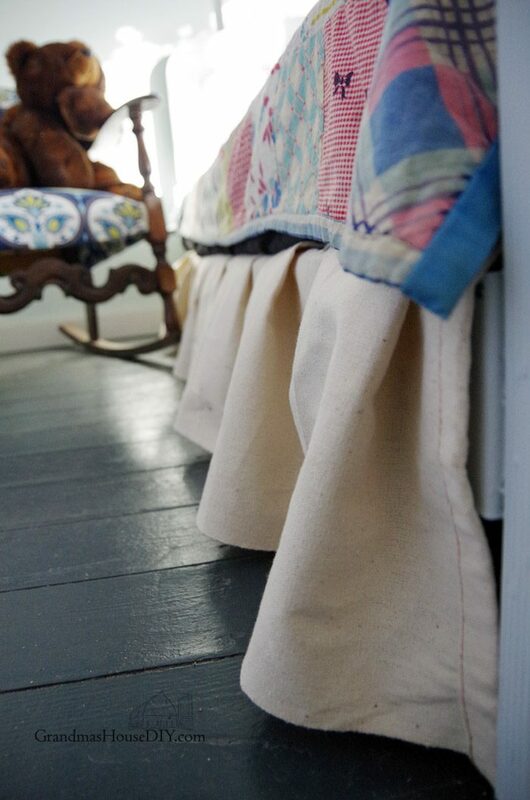 What a clever way to make a valance for a bed. Affordable too, bonus! Thanks Claire it was so easy too! It turned out really cute! Thanks for sharing it with SYC. That’s definitely my kind of ruffle…I’ll use a sewing machine if I have to, but I LOVE my staple gun (even if it scares me). Thanks so much for sharing at the #happynowlinkup! I really like this idea Tarah. I also have one of those beds with a frame on the bottom and can’t wait to hide it. Thank you Mary! I’m on the lookout now for some storage I can slide under the bed now that its all hidden! 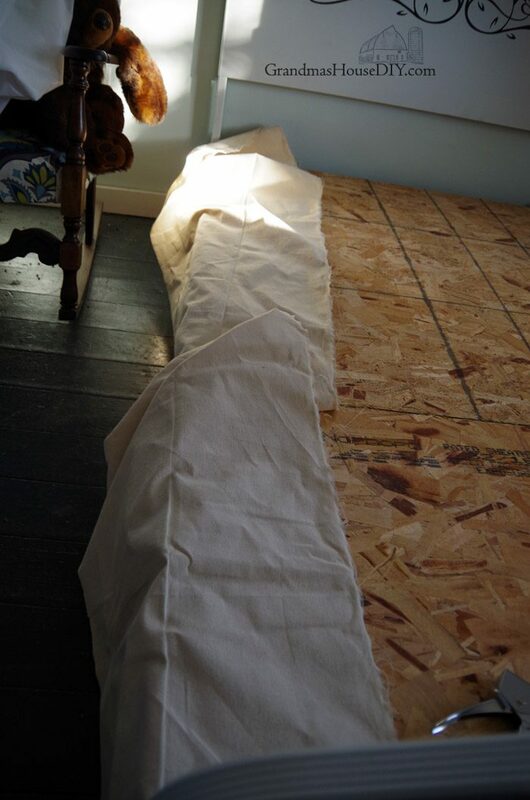 What a great solution – I haaaate trying to spread out a full on ruffle under a mattress. Thanks for sharing with Party in Your PJs! Thanks for coming by Lynda, have a great weekend! Absolutely love your guest bed, where did you find that? Its so unusual, which I love anyway, something different. Your idea for bed skirt was ingenious, there you go again. makes my heart so happy to see somebody work it out instead of buy it. To me it’s always a challenge how to figure out how to make do instead of going to store. For us it’s a matter of money, living on our SS here is a challenge every month, especially with so many 5 week months, ouch. Over Christmas was interesting, we got paid day before Thanksgiving then not again til 2 days after Christmas, merry merry,lol. But we survived well, have had lots of practice since we moved here. Grand Junction is a place for wealthy people. All those GenX’rs. Am so glad I found your blog while back,you are a ray of sunshine. Have great Sunday.Printed out how you made your doors so Mr.Furry could see. Hi JaneEllen, the bed is VERY old and was in this house when I took I moved in after my Grandparents’ passed – I just gave it a new paint job and a makeover last week. This actually used to be the front of the house before this room was added so that beautiful old window actually was the real star for a long time. Thanks so much for coming by!! 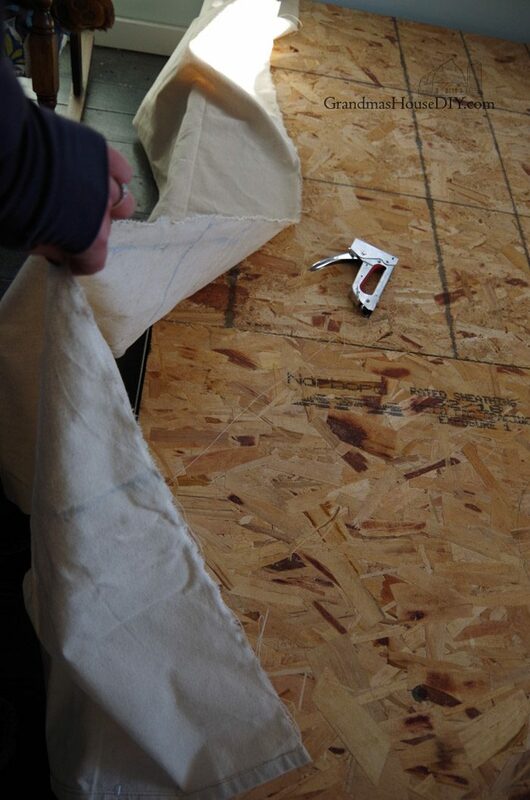 You would think these are sewed, no one would know and they make sure a huge difference to the bed. This looks wonderful and of I love the feminine touch. Great job. That turned out so cute!!! 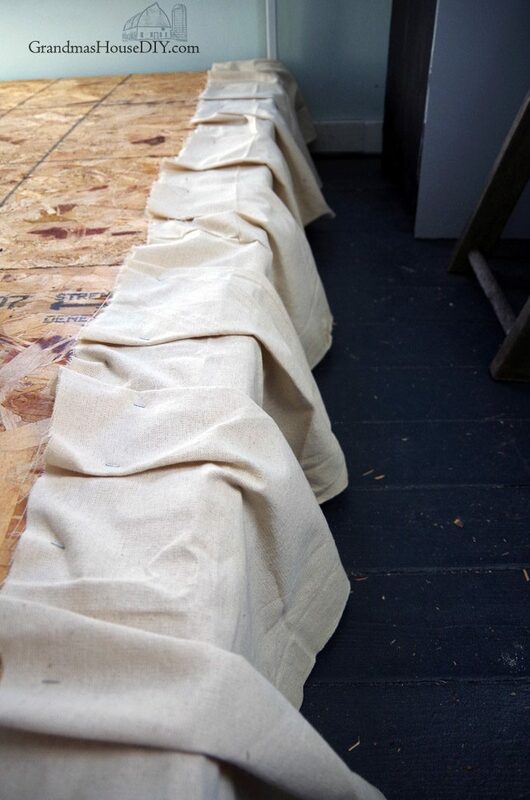 I would have never thought to use drop cloth. What a great idea Tarahlynn! You are so good of coming up with solutions w/o breaking the budget. Thanks for sharing at Home Sweet Home! Thanks Sherry, have a great weekend!